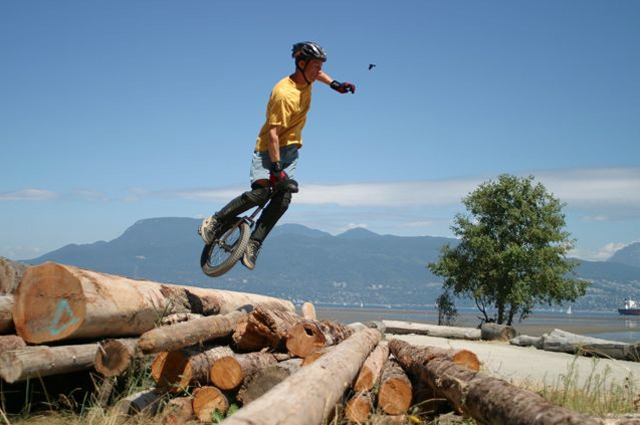 Kris Holm is one of the early mountain and trials unicycling pioneers, and was the first rider to bring mountain unicycling to a mainstream audience through film, television and magazine features. He also played a key role in the innovation of modern unicycling equipment through his brand, Kris Holm Unicycles. Kris‘ main interest is independent, exploratory riding, which has taken him down mountains in North and South America, across remote regions in Bhutan and Mongolia, and through steep trails closer to his home in Vancouver, British Columbia. Kris is an ambassador for the environmental business alliance 1% For The Planet, weaving the simplicity of unicycling into advocacy for sustainability. Kris will be talking about unicycling as a metaphor for balance, persistence and living simply. One Response to "Feat 2013 Speaker Announcement – Kris Holm"